Could your child end up in the hospital with alcohol poisoning or severe burns this Christmas? You may think that’s impossible, but according to the Consumer Product Safety Commission, in every year since 2009, at least 12,000 emergency department visits have occurred during the holiday season. That’s about 250 injuries per day, and more of those patients are in the 5 and under age group than any other. While we don’t want parents to be fearful or avoid decorating during the holiday season, real injuries do occur every year. A trip to the hospital is a Christmas memory that nobody wants. Here are some holiday hazards that even the most experienced parents might miss. Nearly every house has some sort of light strand on display during the holidays. Electric shock is a common injury during the holiday season. Make sure that wires are not frayed or exposed, and that outlets are protected from curious little fingers. The strands are also strangulation hazards. Children have died after becoming entangled in loose light cords, and many others have ended up in the emergency room after chewing on those shiny bulbs that can shatter easily in little mouths. Anyone with a toddler can tell you that those beautiful, sparkly, crinkly-sounding ornaments are just too fun for tiny hands to resist. 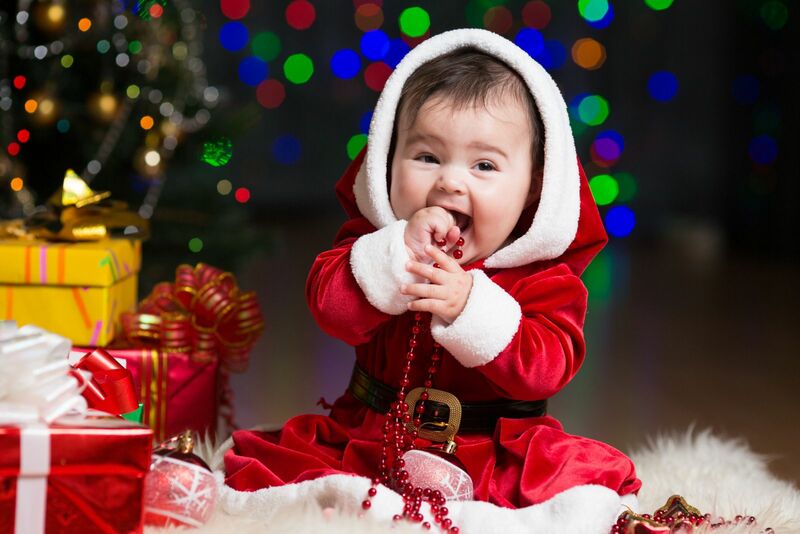 Remember that ornaments are choking or cutting hazards if a child puts them in their mouth or squeezes them too hard. As a side note, some wrapping paper may contain lead; so, when your slobbery, teething little one wants to give that shiny paper a taste, it’s best to give them a substitute. Most parents recognize the dangers of a stove, but during the holiday season, it’s easy to miss a curious toddler in a busy and bustling kitchen. Severe burns to children dramatically increase at the holidays- especially burns from boiling water. Have a 3-foot safety zone using baby gates or other barriers around the stove to keep children away. Anchor your stove to the wall and cover front-mounted knobs so little fingers cannot accidentally turn them on. Remember- even if you have taught your own children to stay away from the stove, there may be visiting children in your house who do not know the rules and will attempt something dangerous that you are not expecting. After late nights of board games and retelling holiday stories, guests frequently leave unfinished alcoholic drinks laying around the house at toddler eye level. When your children wake up and see the brightly colored drinks in fancy glasses, it’s very tempting to take a sip. The Drug and Poison Information Center receives an increased number of calls about alcohol poisoning in young children this time of year. Remember, because they are smaller than adults and have a different metabolism, even small amounts of alcohol can have a dangerous effect on children. Pick all drinks up at the end of the night and lock alcohol safely away in a cabinet. During the holidays, we often have guests in our homes. Make sure that you are aware of any food allergies that may exist. Also, remember that there are many party foods that are a choking hazard for little ones. These include nuts, hot dogs (like those delicious beanie-weenies), mini carrots, and popcorn. Speaking of food being left out, incidences of food poisoning also increase at the holidays. Make sure to hold hot food at a temperature of at least 140 degrees and keep cold items refrigerated or on ice. A house full of Salmonella can really put a damper on Christmas morning fun. Yes, it’s true. Those exceedingly obnoxious fun cards that well-meaning grandparents love to give to your kiddos have a danger other than driving parents crazy by playing the same song repeatedly until the batteries die. Those cards contain button batteries, which are often easy to access. Ingesting these batteries can erode a child’s esophagus and GI tract, which can lead to severe injuries or even death. While this may be a great excuse to ban these ear-worm inducing cards from your festivities, it is also a real danger that has injured children across the country. Even if you are used to locking up your medications to keep them out of the hands of the little ones in your house; Grandma, Grandpa, Aunts, and Uncles may not be accustomed to taking these precautions. A bottle of pills left on the end table could be deadly to kiddos. Provide your guests with a safe place to keep their medications. You might also ask them if they have other items that could be a hazard; such as knives, guns, or lighters that need to be kept out of reach and secured. After you give your preschooler that $75 toy that they begged for, they will want to play with the giant box. Eventually, the boxes will fall apart and you may just find it easier to burn the cardboard and paper in your fireplace. Unfortunately, houses are destroyed every year by flash fires cause by burning wrapping paper and bows. The light-weight embers from these items can also blow out of the fireplace, causing the surrounding items to catch on fire. Be sure to dispose of flammable items safely, and properly remove hot embers and ashes from your fireplace and home. With a few simple precautions, you can avoid serious accidents, injuries, and illnesses this holiday season. Alternatively, you may find it too stressful to take these added steps, which gives you a wonderful excuse to have your holiday celebration at someone else’s house. You’re welcome.